The NHL season will kick off in less than 48 hours, so the window to draft your fantasy team is rapidly closing. How do you prepare? NHL.com provides their top-175 rankings – as well as positional rankings – to help you make the right choice when you’re on the clock. Their rankings provide an excellent base on which to map out your fantasy strategy, but there are some players that I predict will rise above their current expectations, some that will fall short, and some that I think will have more value than you think. Justin Schultz: He tore it up in his abbreviated stint in the AHL, and will have an opportunity to quarterback one of the most explosive power play units in the NHL. His only competition for the role is oft-injured Ryan Whitney, and Schultz is talented enough to leapfrog him without an injury. To the chagrin of Anaheim fans, Schultz will end up a top-15 defenseman. Taylor Hall: Keeping it in Edmonton, Hall and Nugent-Hopkins will both manage to stay healthy for the whole season, and Hall will reap the rewards from the pairing. Whether it’s Eberle or Yakupov on the right side, look for him to finish among the top 10 goal scorers. Jordan Staal: The “other Staal center” has been under-utilized throughout his entire six-year career as a penalty kill specialist with some offensive touch. He’ll certainly get his chance to be relied on offensively in Carolina. Considering he frequently had linemates such as Matt Cooke and Tyler Kennedy in Pittsburgh, playing with scorers like Eric Staal, Jeff Skinner, and Alexander Semin will set him up for a career year offensively. Forget top 80; think top 30. 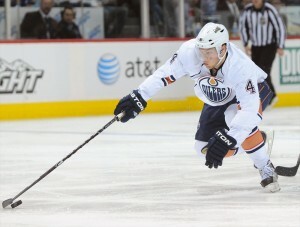 Kris Versteeg: Versteeg had a career-best 54 points in his first season in Florida, but he could have scored much more. In the 2011 half of the season, he scored 38 points in 38 games. But after the calendar turned, he scored a paltry 16 points in the remaining 33 games. With a full season in Sunrise under his belt – and offensively gifted center, Jonathan Huberdeau, flying up the depth chart – Versteeg will be scoring like it’s 2011 again. Marian Gaborik: Playing in all 82 games for the first time in his career, Gaborik had 41 goals and 76 points in his third showing on Broadway. Call me pessimistic, but I don’t think he holds up for another full season, especially in a compact 48-game schedule. If he returns to his ways of missing 10+ games, he won’t have any value on your fantasy team for a large portion of the season. Rick Nash is the high-scoring Ranger to target. Jarome Iginla: Being productive over 35 in the NHL isn’t as difficult as you’d think – just ask 40+ year olds Ray Whitney and Teemu Selanne – but you’ll be hard-pressed to find a 35-year old that plays every game as physical as Jarome Iginla. Year after year, he bears the scoring load for a team devoid of a star playmaker, and he hasn’t missed a regular season game since the 2006-07 season. Iginla dropped from 86 points to 67 last year, and I expect that trend to continue. Kevin Bieksa: Bieksa scored 44 points last season, but as the third best scoring defenseman in Vancouver, it will be hard to repeat. Expect more scoring to come from offseason acquisition, Jason Garrison, but Bieksa will still deliver hits, PIM, and a decent plus/minus. Alex Galchenyuk: Tomas Plekanac is banged up to start the season, and David Desharnais doesn’t possess the pedigree or offensive ability of Galchenyuk. All he needs is to stick with the Montreal Canadiens and get an opportunity to skate with the top line. Once he establishes what he can do at the NHL level, he’ll be a favorite for the Calder Memorial Trophy. James van Riemsdyk: The 2011 Stanley Cup Playoffs seem like a distant memory now, but it was then that JVR showed flashes of the dominant power forward that he could become. The potential is there for him to take over games and fill the scoresheet. If Joffrey Lupul starts off slowly, or Toronto decides to experiment JVR at center, the 2nd overall pick from 2007 could make one of Brian Burke’s final moves as GM a memorable one. That opportunity could be the golden ticket that takes Schenn from up-and-coming prospect to a present star. Like departed Flyers first-liner, Jaromir Jagr, Schenn is a left-handed shot that could benefit greatly from Claude Giroux’s slick passing.